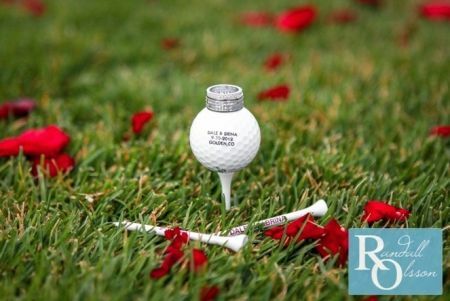 Golf themed wedding favors are a great way to celebrate the love of your life and the love of the game. 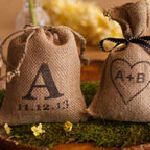 Because sports and fitness plays such an important role in our lives, it is no surprise that unique wedding favor ideas with sports themes are becoming increasingly popular. 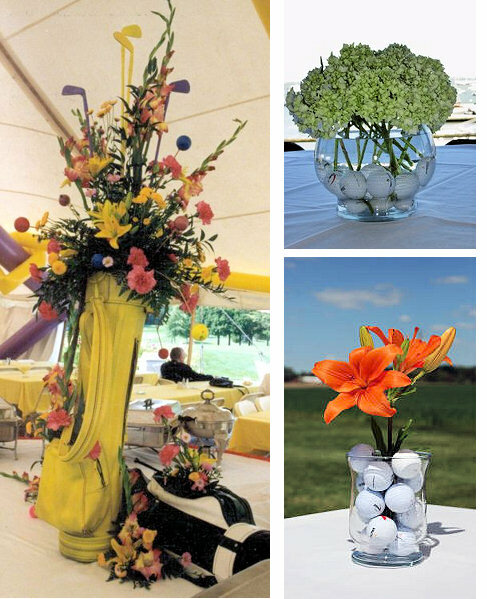 There are golf party favors to fit any budget or theme. Your passion for golf will keep you on course with a few of your favorite things. You have planned a truly unforgettable day, including all of your favorite things. 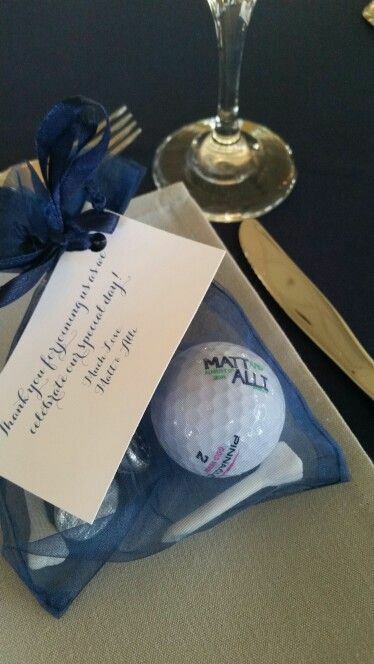 The perfect finishing touch is the wedding golf favors. Bottle openers, wine glasses, identification charms, ornaments, matchbooks, key chains, keepsake boxes, and luggage tags all can be personalized to reflect your interest in golf. 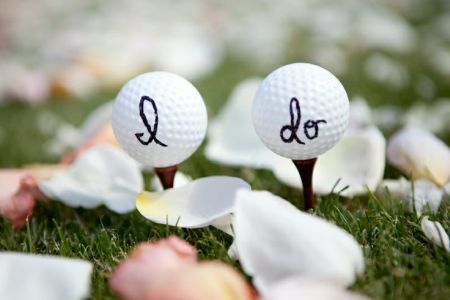 Looking for golf themed wedding favors that will show off your love of the game? 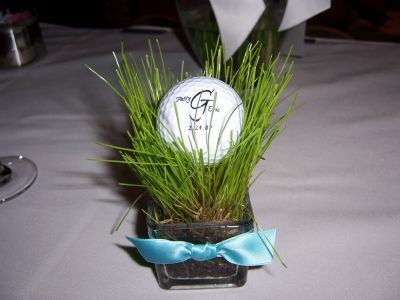 What better way to display your golf wedding favor than on the green. It's amazing what presentation can do. Real grass planted in clear containers instantly creates interest and draws you in for a closer look. It certainly made us take a second look. 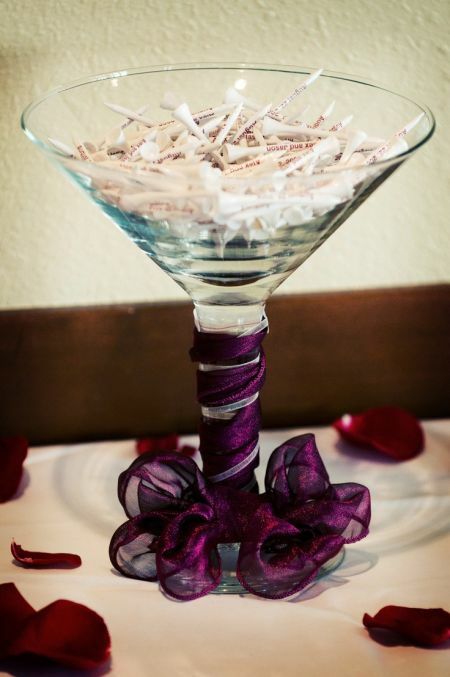 We love this wedding favor display snapped by photographers, Lin & Jirsa. It stands to reason that wedding photographers get to see the best of the best. This simple box tied with an elegant ribbon is a perfect example. Golf theme to a tee. Having a ball with golf themed wedding favors. The packaging makes this favor a hole in one. Easy to grab on the way out, golf fanatics will enjoy this practically par-fect gift. Make every tee off memorable for guests who share a passion for the sport. Tie on a personalized golf tee to make your favor a big hit. 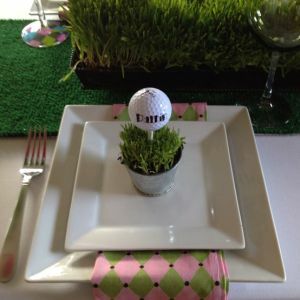 The golf theme inspires every detail of this tablescape from the flag to the green turf runner. The yellow tulips help soften the overall look and add a splash of color. This martini glass filled with tees defines celebratory golf in a way that still feels modern. 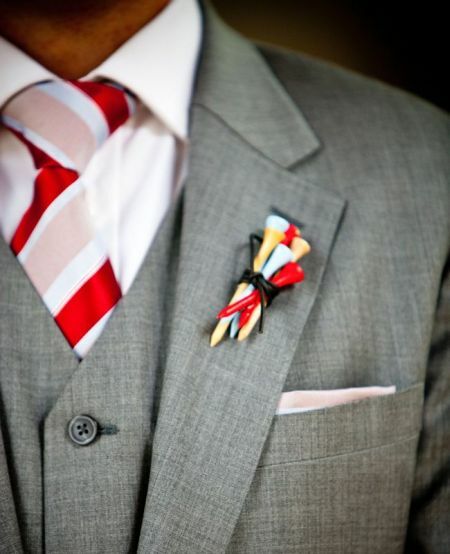 The ribbon wrapped stem gives a festive touch. Glass cylinders are the clear choice to display a few of your favorite things. Choose containers of various shapes and sizes to add interest. 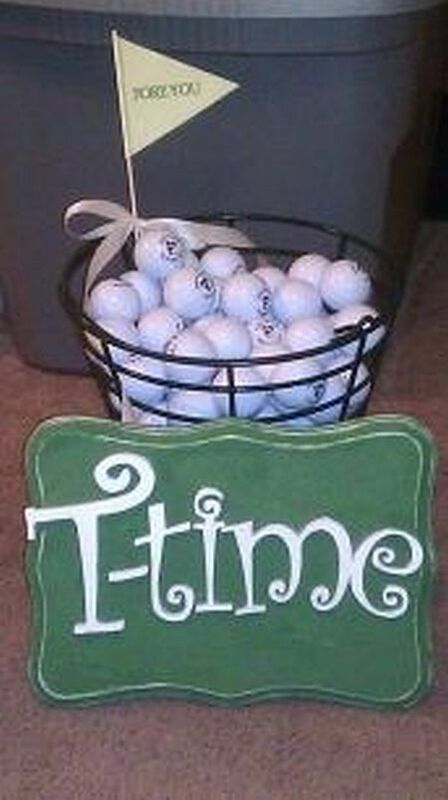 A fun and functional wedding favor display that is all about golf. Sophisticated, yes. Complicated, no. 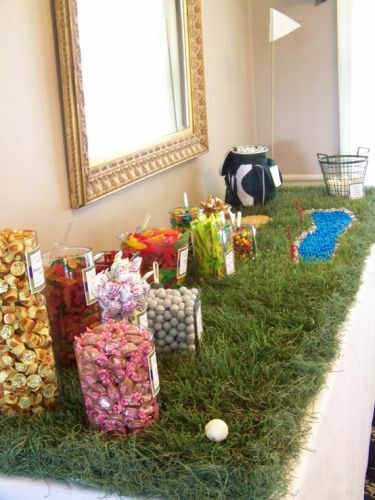 Create a golf themed candy buffet at your wedding reception. 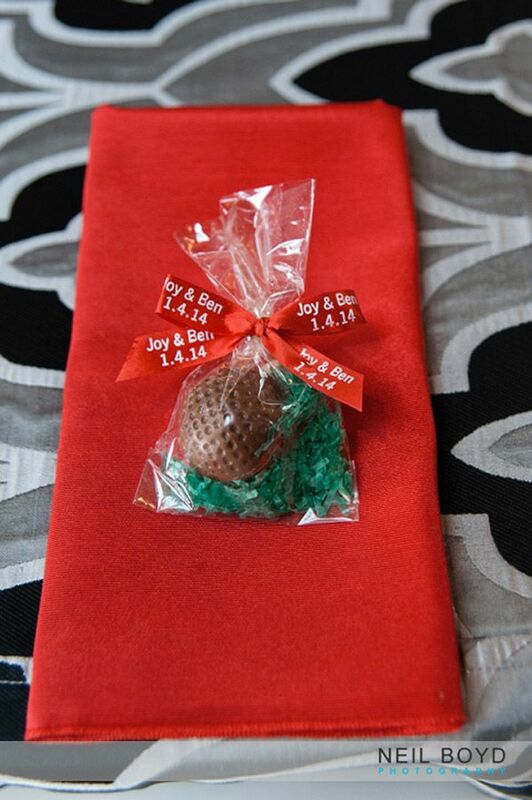 Coordinate candy by color, type, and personalize some with the golf theme. Use containers that fit the formality of the occasion. For example, the picture shown here has a more casual look, but can easily be made more formal with more sofisticated glass containers of different heights and sizes. Provide containers or bags for take home convenience. Guests of all ages will enjoy serving themselves to their favorites. 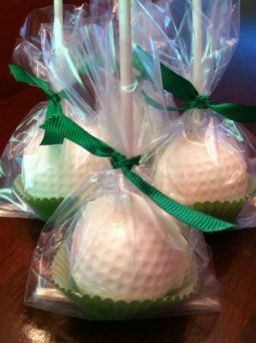 When the cake and the game you love team up, they deliver golf themed wedding favors your guests will love. What could be sweeter? 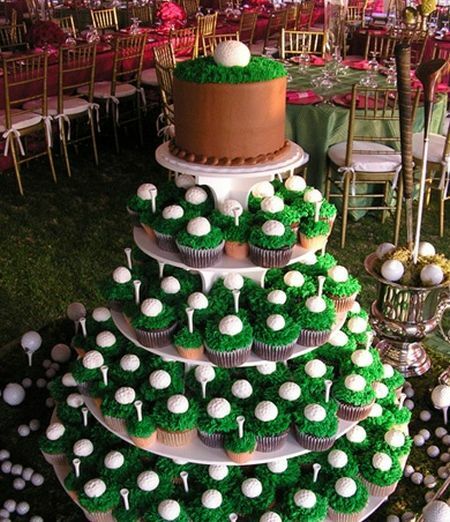 This cake design certainly depicts the groom's interest in golf. 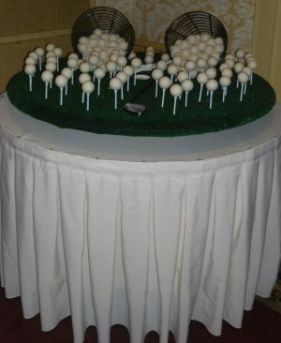 We love how the cake table is personalized with green turf, tees, and of course golf balls. Treat your thirsty guests to a cool, refreshing drink. 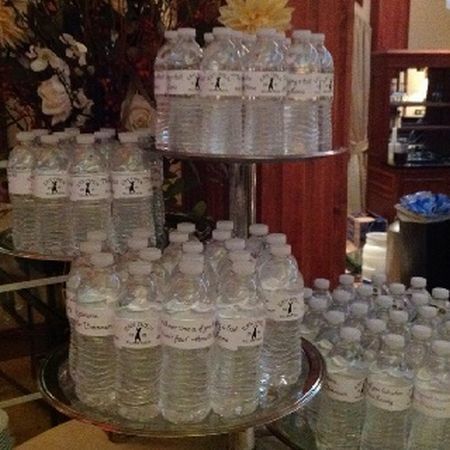 Water bottles personalized with your names, wedding date, or any cool design will surely hit the spot. 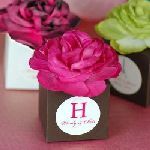 Greeting guests with favors at the table is a fun idea. Both of these favor ideas are proof that packaging matters and the power of personalization is undeniable. 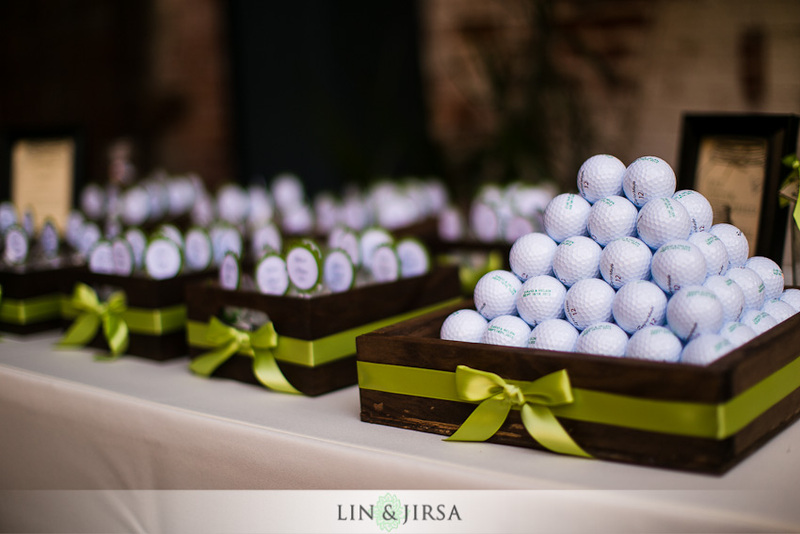 Wedding favors and golf balls are a perfect pairing. Add your names, date, and meaningful picture or emblem to make it your own. 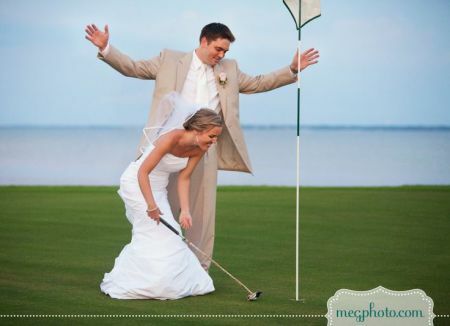 Every swing of the club will commemorate your big day. Create a grand focal point. We're pretty sure guests will go home talking about this golf bag centerpiece. People love fresh ideas that they have not seen before. This one certainly checks all the boxes. Creative and unique, all thanks to a golf bag idea from Creative Cuisine Catering. However, if you prefer something a little more subtle, consider one of these smaller floral displays that complements the theme on a smaller scale. 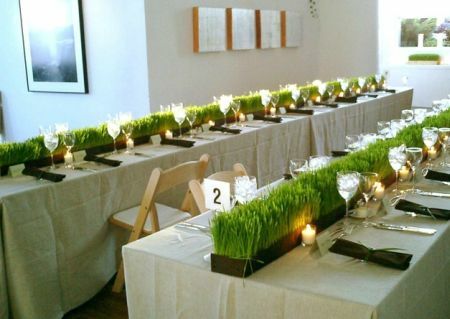 We love this idea for a sit down dinner. 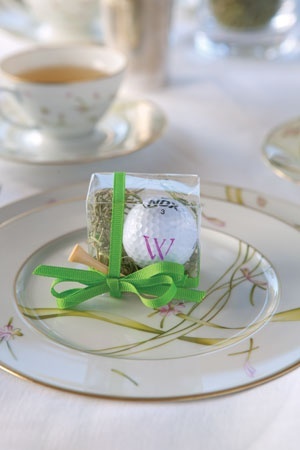 Tee up your golf themed wedding favors and place right onto the dinner plate. 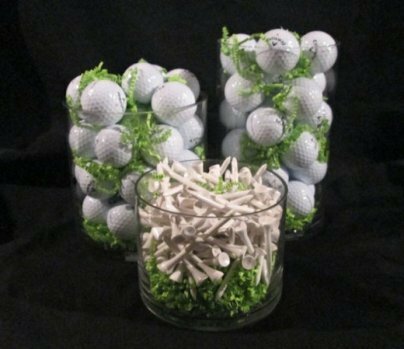 Attaching a personal thank you note to your golf wedding favors is a novel idea. The smallest of details can make something as simple as a golf tee very special. 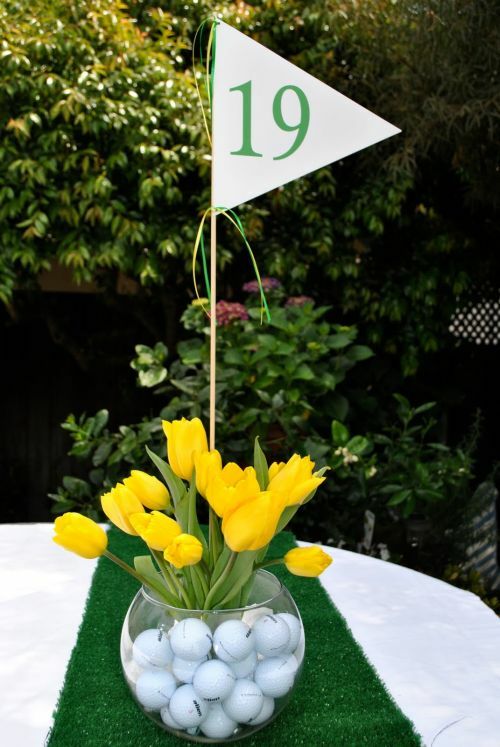 This golf favor display aced the theme and kept the gift practical. If you want to personalize, do it on the favor tucked inside. Impress your guests who love golf and the spirits. 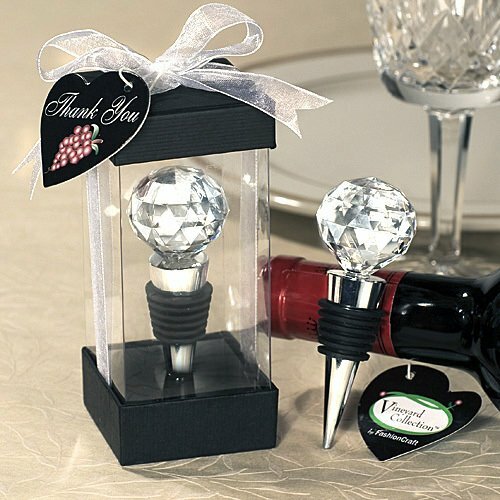 A classic wine lover favorite is a bottle stopper topped with a beautifully cut acrylic golf ball. 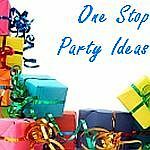 Other great wine favor ideas include golf themed wine bottle wrappers and glass coasters. If wine is not your preference, consider beer koozies or shot glasses. 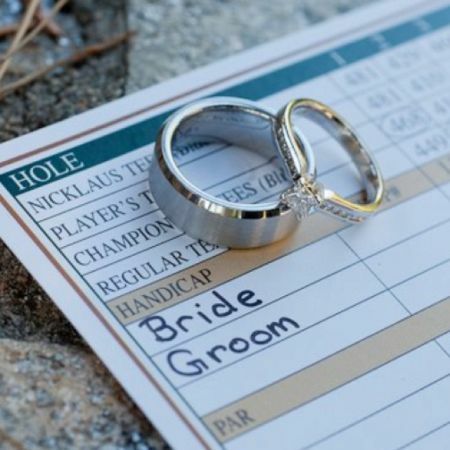 Any of these wedding golf favors is cause for celebration. It's extraordinary just what can be conjured up with color. Treat your guests to delicious, personalized candy favors. Everyone loves Hershey kisses, so smack on a golf motif for a sweet idea. 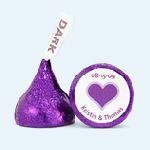 If a chocolate bar is more appealing, design a personalized candy wrapper to make your guests smile. Made of the finest chocolate, these sporty confections will be the perfect touch to your perfect day. As an alternative to chocolate, you may consider personalized mint tins or jars of honey appropriately dressed with the golf theme. 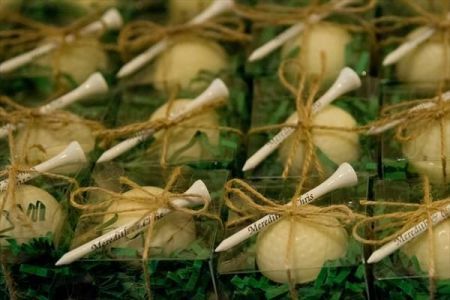 Tastefully done, golf themed wedding favors are a wonderful way to say thank you. Grass and golf go hand in hand. 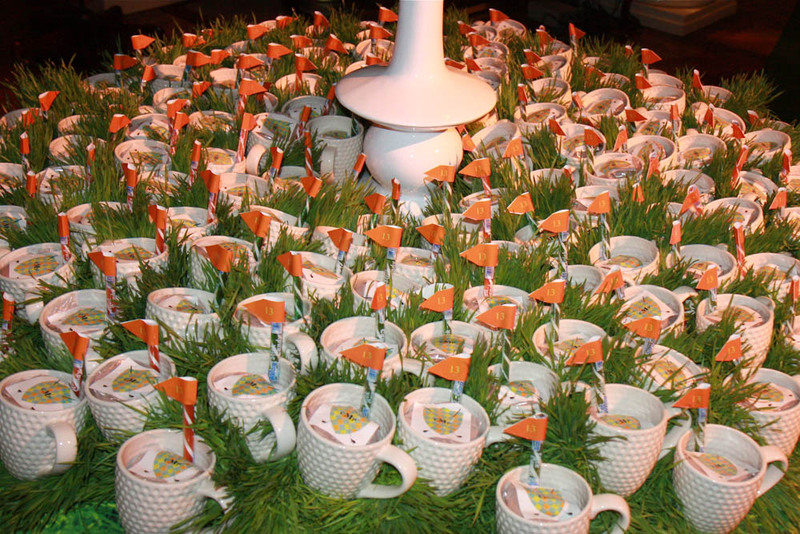 Create golf inspired favors using brilliant green grass. Whether you use real or artificial grass, the results are stunning. 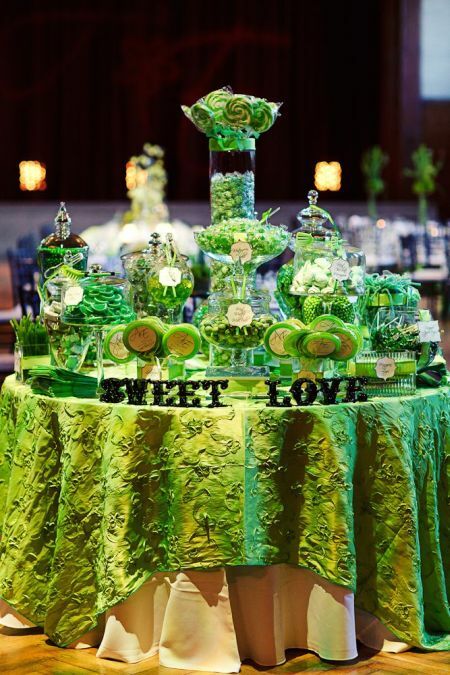 The pop of green is perfect for displaying your golf themed wedding favors. 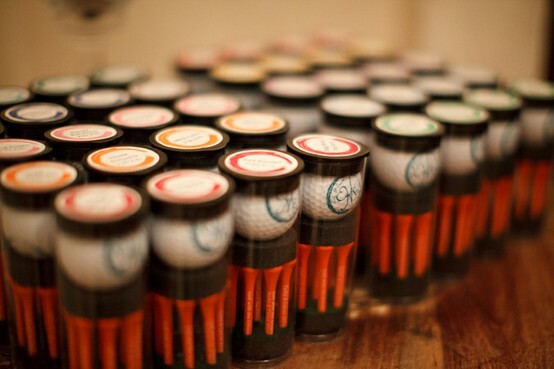 Display your golf themed wedding favors creatively. Frame pictures of the bride and groom taken at the golf course. Arrange on the favor table for an inexpensive personal touch. 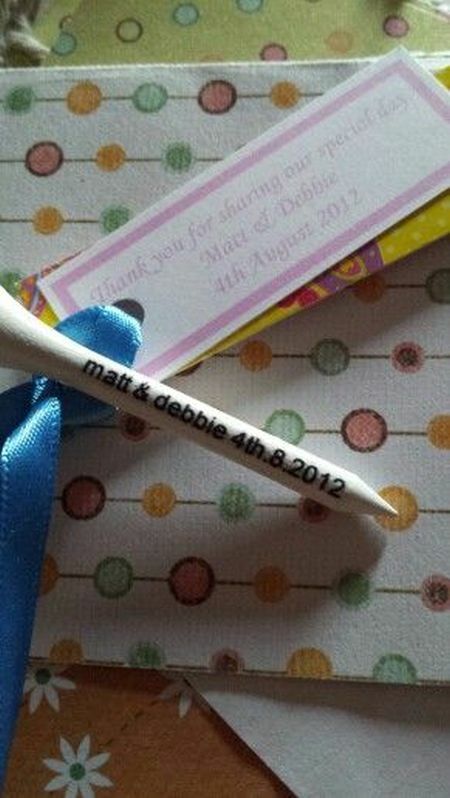 Add golf tee wedding favors or other golf related accessories to complete the golf theme. 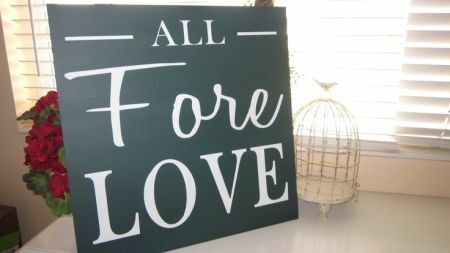 Your wedding guests will appreciate the time and effort that you put into keeping your favors on the green. Good sportsmanship and team playing learned from golf will serve you well to avoid the sand traps or water hazards ahead as you settle into married life. A clear or green bag is always an option for unusual shapes and sizes. Creative packaging never goes unnoticed. Make your take home favor distinctive with fun, affordable favor bags.